Every year, British retailers give us 11.2bn paper receipts, at a cost of £32m. These apparently weigh over 7.5m kilograms – around the same as 1,380 male elephants. Is it time to switch to digital receipts? According to receipt processing and management service ExpenseMagic, if you put those 11.2bn receipts end-to-end they’d measure 1.8m kilometres. That’s equivalent to 140 times around the equator, or the same as going to the moon and back twice. What a colossal waste of paper. Still, I’m in two minds about this. After switching to online banking and billing, I’m happy that my doormat isn’t covered in piles of post (apart from the odd junk mail). But I still think there’s something reassuring about getting a paper receipt when you’re shopping on the high street. You can pop it in your wallet and keep it just in case you need to return your purchase. You can even keep it as a souvenir in order to remember that special day out with your significant other (or not). Yet, when I look at US retailers, like Apple, Sears, K-mart, Gap, Banana Republic and Best Buy, issuing digital e-receipts for their customers, I start to think about the amount of paper, money and wallet space we could save in ole Blighty. With many UK shops now offering contactless payments, perhaps it’s time they modernised further and ditched paper receipts altogether? Bulging wallet – money or receipts? It was only yesterday that the Which? Convo team was denied a discount on our pub grub, due to this particular establishment refusing a digital voucher. They were adamant that they needed a paper copy to put into their till – we were keen to push them into the 21st Century. Most of the time paper receipts wallow in my wallet, building up over the weeks before they make it impossible to shove my wallet into my back pocket. Then comes the task of sorting them into the ones you want and the ones you don’t, and then shredding the latter so you can dispose of them safely and responsibly. With an e-receipt, there’s no such problem. Pop them into a secure folder in your email inbox, or sort them into a spreadsheet – job done. Of course, there are a few negatives to digital receipts. You’ll have to give retailers your email address, which then potentially leaves you open to their maddening marketing messages. Sure, that might be good for them, but not so much for us. Perhaps they’ll soon be able to ping e-receipts directly to our smartphones when we swipe for a contactless payment, hence removing the need for an email. Of course, if you don’t have a smartphone or rarely use your email, digital receipts might not be suitable. My response would be to say that if Britain’s retailers can at least start offering e-receipts to those of us who want them, maybe we can stop wasting so much paper. Should shops offer digital e-receipts? How would paperless receipts affect this present problem ? I go to buy on Sayamazon, get passed on to Stuff.com and they say my card a/c will show a deduction by Tradingnameco. I have enough trouble trying to file it already. 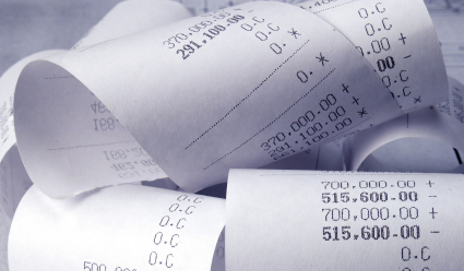 I have been advised that there is legislation requiring merchants to issue printed receipts. The organisation who advised me has so far not given me a reference so that I can verify this. I have made several searches on the Internet but have found no reference to this. This affects taking payment by credit card using a phone app. Can anyone throw some light on this? I had a recent message from Transport for London Taxi and Private Hire advising that there is a legislated requirement for issuing printed receipts for credit and debit card transactions. I have queried this with them as have not been able to find this bit of law. That was about a month ago and am still awaiting clarification. Many taxis now take card payment and some such as Hailo send receipts by e-mail. available to customers now via their online banking facilities. Can anyone point me to any legislation requiring shops to always provide a receipt? Hi Dickie, we’re not aware of any such legislation. And although it’s definitely a good idea to have a receipt for when you might need to return a product, it’s not always necessary. Does this 32m cost includes money spent on ink, or just paper? OK, so I’ve just finished paying for my shopping. I expect a receipt… but just a small one as I hate to see wasted paper, and with modern technology, we should be wasting less paper, not more! But no, apparently I need a mega-receipt telling me that I could have saved more if I’d shopped somewhere else. So, give me the discount now if you know how much I’d have saved! But no, I get a coupon I’ll probably lose, or forget to use, then I’ll find it somewhere in my wallet… a day after it ran out and became useless! And not only that, I get a coupon for cheap fuel and money off home delivery… great, so how do I get my narrowboat to your fuel pumps, and when exactly can you deliver to my narrowboat moored up on the towpath several miles from any road you could get a delivery van down?! Maybe I’m unusual in living on a boat, but I never buy the products I get copious coupons for, presumably in a bid to encourage me to buy them… but I don’t want the product on offer, so I don’t want the coupon… and I ABSOLUTELY HATE the waste of paper! If I could change three things about supermarkets, two of them would be to get rid of coupons, and have discounts taken off when you pay, not at some later date. Hi Patrick, what are your sources for the 11.2 billion receipts per year and the £32 million cost per year?